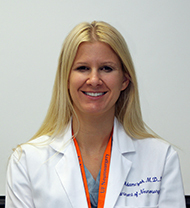 Home Resident Education Our Current Residents Stephanie Adamczak, MD, Ph.D.
Stephanie Adamczak was born and raised in Chesterland, Ohio. She completed her undergraduate degree in neuroscience at Baldwin Wallace University while also working as a paramedic in a busy trauma center. In 2007 she was accepted into the MD/PhD program at the University of Miami where she completed her PhD in neuroscience, studying neuroimmunology. There she identified a novel cell death mechanism in neurons called pyroptosis, which earned her an NRSA F31 Fellowship by the National Institute for Neurologic Disorders and Stroke and a Development Research Award by the Lois Pope LIFE foundation. Taking advantage of Miami weather, Stephanie also competed in triathlons during medical school. 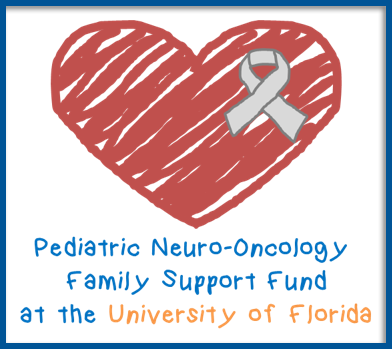 Stephanie began her neurosurgical training at the University of Florida in 2014 and is scheduled to complete her training in 2021. She enjoys running, cycling, and spending time with her husband, Bill, and 2-year-old daughter, Evelyn.